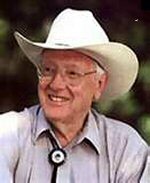 Born in1926 in Iola, Kansas, Don Coldsmith has had many jobs and several careers. After graduating from Coffeyville High School, Coldsmith served in the Army in World War II as a combat medic. After the war he graduated with a degree in Psychology from Baker University. He worked as a youth director for the YMCA in Topeka for several years and then went to Kansas University and earned a doctorate in medicine. Coldsmith practiced family medicine in Emporia, Kansas, for thirty years before he retired from that career in 1988. Between his high school graduation and present, he found time to own a mail order gun-smith business, be a taxidermist, be a vocalist in a men’s quartet, sell bait in a bait shop, spend one year as a clergyman, and to breed and show Appaloosa horses. Coldsmith has taught at Emporia State University and he had been married to Edna for many years. Together they have raised five daughters. During his years as a medical doctor, Don spent a lot of time writing books and articles for magazines and newspapers on the back of order sheets while waiting for babies to be born. It was this method that he used to write the first of the books in the Spanish Bit Saga of Western literature that has made his name world famous. This series is based on the moment in history that the horse was introduced to the Plains Indians. In his lifetime Coldsmith has written twenty nine books in the Spanish Bit Saga, and at least twenty other books including historical novels and non-fiction. He has also written magazine columns, and continues writing to this day. Don believes in doing extensive research on his books to make them historically accurate. Don Coldsmith died on June 25, 2009, after suffering a stroke. He was 83. Heron Woman stood outside the lodge, looking to the south. There was excitement in the air. A traveling trader had stopped briefly only yesterday to tell of an approaching column of strangers. Many of them. . . hundreds, maybe. A hunting party? No, it seemed not. A band of one of the tribes who were always moving their skin tents from one place to another? D.B. How do you come up with the inspiration for your books and characters? Coldsmith: Well, you just look at the people around you and put them in situations. D.B. Can you tell me what is the title of your next book, and when will it be out. Coldsmith: The Moon of Madness. Iit should be out this year. D.B. What Kansas authors do you like? Coldsmith: That’s like asking who is your favorite child. If I named any I’d surely leave some out. D.B. You have received many awards and honors. Which one means the most to you? Coldsmith: The greatest honor is when American Indians ask me what tribe I am from. They believe I write authentically as a Native American would. My background is German. Don Coldsmith and his works on Random House's website.